Summer’s creeping ever closer and that means London’s outdoor venues are slowly springing back into life. More great news? We only have to wait until the end of March for Pitch to open its doors again. The Stratford spot popped up for the first time last year and is back for a second season, going big on alfresco dining and craft beer. From the Easter weekend through to autumn, the hub will have street food flying from its patterned shacks onto pastel-hued picnic benches – where revellers can gorge on jazzed-up hotdogs and beef ribs from Tico’s, silky dumplings rustled up by The Gyoza Guys and modern Greek cuisine courtesy of Kalimera. Add crêpes, churros, cans from Camden Town Brewery and cocktails to the mix and you’ll be laughing. A weekly events programme will include classes, networking sessions, family-friendly weekend fun, themed Saturday nights and DJs to soundtrack brunch on Sundays. An outdoor cinema will appear when the days get warmer, and from June, World Cup matches will be available to watch on the humongous HD screen. Pitch Stratford opens Thu Mar 29. Open Fri-Sun in April and Thu-Sun from May. Feeling hungry? 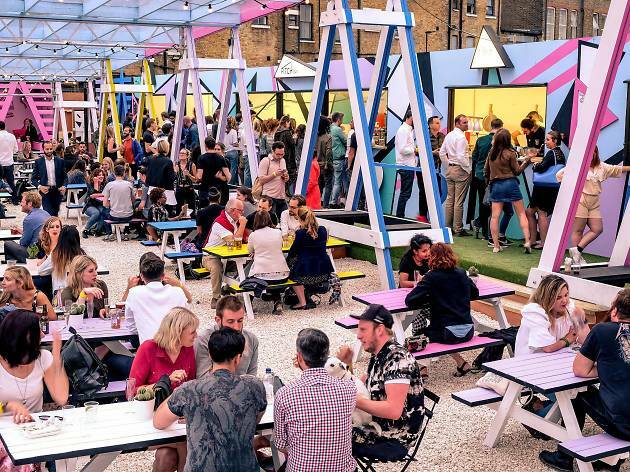 Check out London’s best street food markets and food halls. Want more outdoor fun? A London rooftop bar is being transformed into utopian Las Vegas.